We are proud to stock the brilliant If You Care - 100 Biomass Firelighters - Non Toxic 72 Pieces - Environment Friendly. With so many on offer today, it is great to have a brand you can recognise. The If You Care - 100 Biomass Firelighters - Non Toxic 72 Pieces - Environment Friendly is certainly that and will be a excellent purchase. 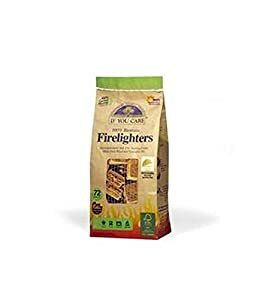 For this great price, the If You Care - 100 Biomass Firelighters - Non Toxic 72 Pieces - Environment Friendly comes widely respected and is a regular choice amongst lots of people. If You Care have included some excellent touches and this equals good value for money. If You Care 100% Biomass firelighters are perfect for: Wood burning fireplaces Charcoal burning grills Wood burning stoves and ovens Campfires and/or outdoor fire pits. If You Care 100% Biomass firelighters have the following additional benefits: Extremely stable with very long shelf life. Do not dry out or lose their firepower even after opening. No unpleasant smells Not oily or greasy Non-explosive Non-toxic Can be stored in proximity to food. If you care firelighters are made with wood from sustainable managed forests and vegetable oils. Therefore, it is made from 100% renewable resources.If You Care 100% Biomass firelighters are non-toxic and harmless when in contact with plants, vegetation or aquatic organisms. No Petroleum Products Some firelighters contain kerosene and/or paraffin or paraffin wax, all derived from petroleum, and therefore based on fossil fuels. With the combustion of some firelighters, formaldehyde - a substance which been classified as a human carcinogen by the International Agancy for research on Cancer(IRAC)and as a probable carcionogen by the U.S. Environmental Protection Agency (EPA)- may be released. If you care firelighters are 100% from nenewable resources and non-toxic. Carbon Neutral Emissions Because If you care firelighters are made from 100% from biomass - wood amd vegetable oil - the emissions resulting from their combustion are considered carbon neutral. This is due to the fact that the CO2 emitted from the combustion of biomass is offset by reduction of CO2 in the atmosphere as a new biomass growth. This is in accordance with guidelines by EPA as well as the Intergovernmental Panel on Climate Change (IPCC). The same cannot be said for firelighters using petroleum products, such as kerosene, paraffin wax or slack wax."